Find accounting, risk management, and collections professionals in the credit departments of several major companies with the help of this ready-made, verified list of emails. 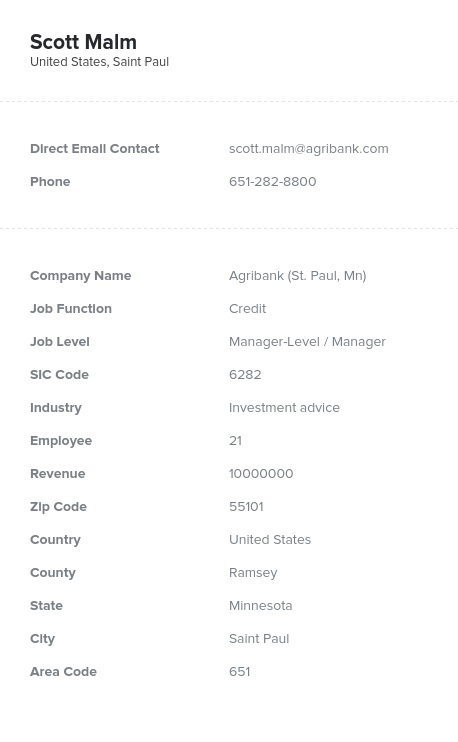 Pull not only emails but key contact information like phone numbers, names, titles, and more! With the contacts listed in this ready-to-download, pre-built data product, you can get in touch with collections professionals at numerous institutions. Download a lead list that only contains the business contacts that are relevant to your B2B marketing campaign: those working with credit. Lists from Bookyourdata.com can help you build stronger connections with those in relevant industries by offering accurate, human-verified data at an affordable price. Use our listing to talk to like-minded bookkeeping professionals working in credit departments, boost your sales, and get great results! To get sales, one has to directly network with the right people. Our credit department email list is the optimal tool for marketing a unique product or software service. Do you have a solution that will help companies collect on debts from consumers and clients? Let those in credit departments know. After purchasing and integrating this list into your CRM, you can contact them right away via email, phone, or mail. Get in touch with credit department professionals now with our downloadable list. You can also further customize a contact solution that's right for your company with our list-builder tool. Contact credit and collections professionals moments after purchasing this data product!